Summer could not have come sooner, and it’s time to start upgrading your home to make it the best summer ever! With the massive developments in smart home automation trends and technology, practically everything’s possible. Here are some essentials ways to use Homey in the summer. Perhaps not the most exciting way to use Homey in the summer, yet it’s very useful. While all smart homeowners will secure their house with sensors, not everyone uses smart home tech in their yards. Like indoors, outdoor smart home gadgets offer great advantages, including knowing when your backyard gate is opened. It’s great for keeping an eye on your dog, as well as your kids and their little friends. Motion sensors are also of great value when it’s dark out. Like with indoor nightlights, you can turn on the lights when your children come home from playing with the neighbourhood kids. You could also use a smart switch to automatically turn on the lights when the sun sets. Important note: Because not all sensors are weather proof, we recommend to either look for weather proof sensors, or mount them in a way that they remain unaffected by weather circumstances such as rain. For example, place them in a waterproof casing. The harsh summertime sun that shines into your home through the windows causes your house to heat up like never before. Instinctively you open all windows to let a breeze come in, while somebody else might fire up the AC. Both fine solutions, but there’s an easier one. By mounting motorised blinds to the window frames, you can easily manage the heat gain. Schedule the times for the blinds to open and close automatically through your Homey Flows, based on the position of the sun. Homey offers a few ways of taking the party outside easily. For instance, it’s easy to let Homey know that you’re taking the party outside. Adjust a sensor on your backdoor to automatically set the backyard to party-mode. Play the music on the soundsystem outside and automatically turn on the garden lights. A party should never have to stop when the sun goes down. Installing smart lighting outdoors will keep the vibe alive and kicking. There’s no need to blind your guests with extremely bright outdoor spotlights. 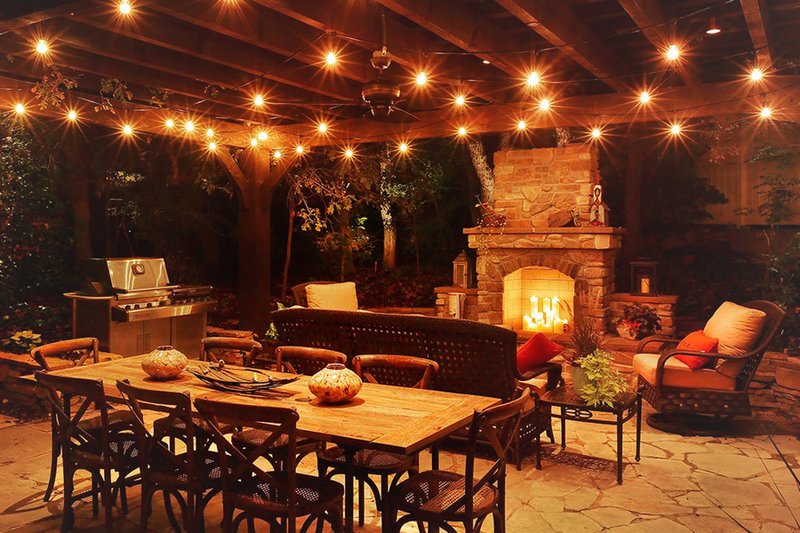 Set the mood with automated party scene lighting outdoor, just like you’re used to when setting the mood with your smart lighting indoors. When the final drink is poured, there’s no need to fumble around with the light switches on your way to bed. Open up the Homey Smartphone App and turn off your audio, lights and all the other devices you brought outside, while your Homey Security Flow gets on duty for the night. 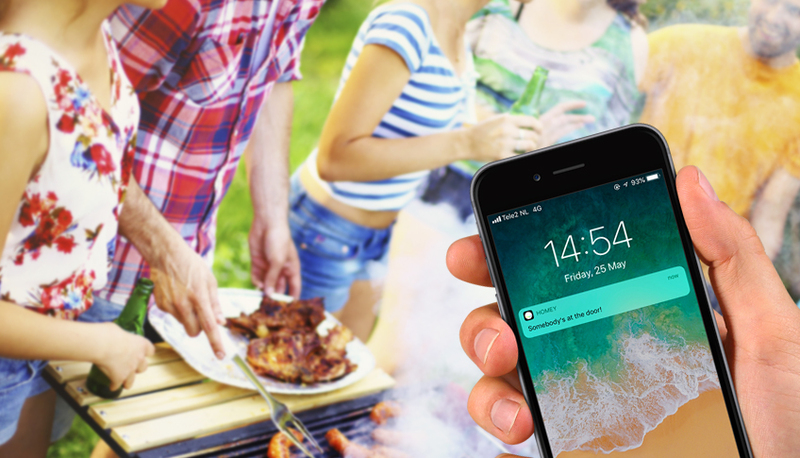 There are loads of smart gadgets to help you manage your barbecue: Meat thermometers, cleaning devices, etc. However, you’ll find that the most important factors in successful barbecues are the people attending, not how fast you can clean up afterwards. So, make sure everybody is there. Have your doorbell send you a push notification on your smartphone. That way, you’ll know when somebody is at the door, even when you’re in the garden standing over the grill with your other guests. This ties in very well with taking the party outside. Activate your barbecue scenarios, such as the doorbell Flow, once the party is actually outside. Going off to the cottage should be relaxing. Not knowing your home is safe can disturb that. Upgrading your security system with Homey will allow you to easily keep track of what’s going on in and outside of your home while you are away. Receive notifications when there is any movement in your home while you’re away for the weekend. Already 3 hours underway only to remember you may have forgotten to lock the door? Easily monitor and control your locks, lighting, and security right from your phone. All right, now, back to your vacation!